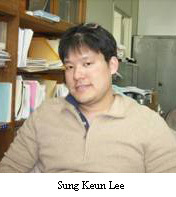 In the March 9 edition of Physical Review Letters, a group from Seoul National University and the GSECARS and HPCAT sectors at the Advanced Photon Source report the first in situ boron K-edge inelastic x-ray scattering (IXS) spectra for alkali borate glasses (with nominal composition Li2B4O7) at high pressure. The glass was synthesized under pressure in a diamond anvil cell and taken to 30 GPa, where the glass undergoes a threefold to fourfold coordination change at boron. For the current work, IXS spectroscopy provides a local probe of the coordination environment with which the fraction of boron atoms in the glass having distinct coordination environments can be directly determined. Results show that the coordination transformation in the alkali borate glass begins at around 5 GPa, with the fraction of four-coordinated boron increasing with pressure from about 50% (at 1 atm) to more than 95% (at 30 GPa). 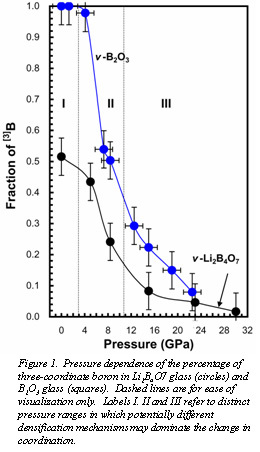 The decrease in the fraction of three-coordinate boron with pressure (Figure 1) shows three distinct pressure ranges, and points to the possibility of multiple densification mechanisms. The lithium K-edge IXS spectrum for lithium borate glasses at 5 GPa shows IXS features similar to those observed at 1 atm, suggesting that the Li environment does not change much with pressure up to 5 GPa. These results provide an improved understanding of the structure of low-z glass at high pressure, important both for glass technology and in relation to magmatic processes in the deep Earth [Lee et. al., Phys. Rev. Lett., 98, 105502 (2007)].